The best swim fins depend upon the need of an individual. There are various types to choose from which will help the swimmer achieve the proper swimming technique. Understanding the different kinds, right fit, style, and model of swim fins are the best way to find out which best suits the need of the person. 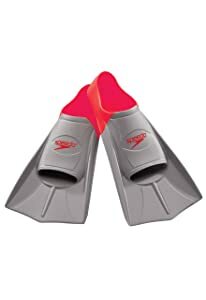 Swim accessories such as swim fins are often made out of plastic or rubber and are designed to help the person wearing it to move swiftly through the water. This is because human feet are much too small to provide that extra bit of force during swimming, especially for open water swimming where divers need to bring along heavy equipment. So why use fins and flippers? It’s simple, they make things much easier. The same applies to a mermaid swim tail, though it has a more decorative function than your regular flippers. Read more: The Best Swimming Goggles to Suit Your Lifestyle Needs. 4 Why Use Swim Fins? In choosing the best swim fins there are several things to consider, the most important thing is the length of the fins, and this would depend upon the kind of training that the swimmer will be doing. For sprinters and mid-distance training, a short blade is used. Mid-sized blade is for mid-distance and distance training and long blades are for scuba divers. Choosing between closed and open heel is important too. The level of comfort varies among individuals. Another thing to consider is the hardness of the fins; the harder the fins the more effort is needed for every kick. This is not beneficial to swimmers who are trying to swim fast. And nowadays, silicone material is available in the market which causes lesser blisters to the skin compared to those that are made out of rubber. 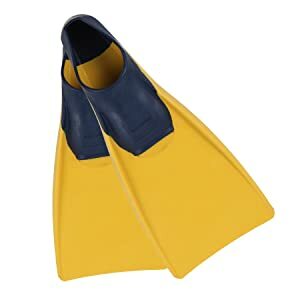 Short swim fins make better swimmers since it actually helps develop the excellent kick techniques, providing more resistance in the water which demands the swimmer to kick faster thus improve their kicking speed. Long Swimming fins are more beneficial to snorkelers, recreational swimmers, divers, and children. It is especially great for beginners, both young and old, who are still learning swimming skills, as it would aid in improving their body position and technique since it naturally moves their hips up to the surface of the water. It can also improve their ankle flexibility, the power of leg endurance and leg support. Notched swimming fins, also known as split fins, are short V-shaped fins which provide the natural motion of the foot as the swimmer moves through the water. These are usually used by swimmers who compete because it creates less resistance with the water; also providing faster speeds and a better performance since it initiates correct kick technique. 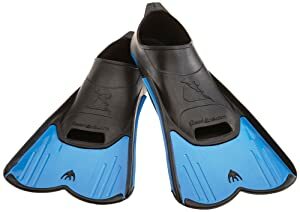 In addition, this type of fins best fit those who have a weak knee and ankle because less effort is needed for every kick. 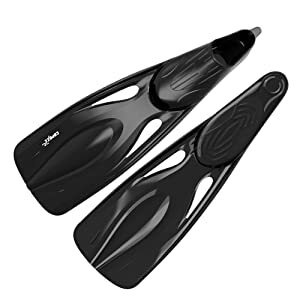 Mono swimming fins are single blade fins and are best used for people who want to learn the butterfly and dolphin kick technique. This is because it influences the swimmer to hold their feet together while kicking. Likewise, it also helps develops both the strength and endurance of the swimmer. 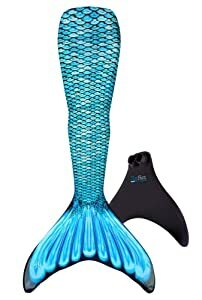 Furthermore, to make it more enjoyable for children, mermaid tail fins can be used instead of the regular variety; these are still mono fins, but a bit more fun to put on. It is also a good way to motivate children to swim mainly to overcome their fear of being in the water and encouraging them to become confident when it comes to swimming. Besides, who wouldn’t enjoy playing pretend for a day while wearing swimmable mermaid tail costumes? Although it may look fun and cute as well, it provides an ample level of challenge which helps children better understand the right movement to swimming properly. As a result, the benefits of swim training with fins shows that it is a good exercise for the heart and muscles of the body. It is made out of soft floatable rubber and assist athletes swim at a faster tempo. With its closed heel design and long hydrodynamic blade, it also provides greater comfort and gives additional force for to flutter and butterfly kick and are excellent for people of all ages. The brand itself is well-known for producing quality swimwear and accessories which are mostly used by Olympic athletes. Orthopedic foot pockets for long term and comfortable use. 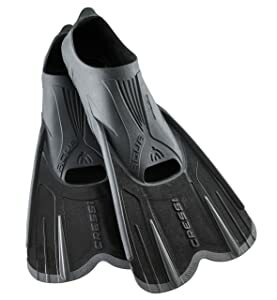 Cressi light fins can be used for both snorkelling and recreational swimming. However, it is specially designed for pool use and swim training since it is lighter in weight, thus you can avoid any muscle cramps or discomfort. 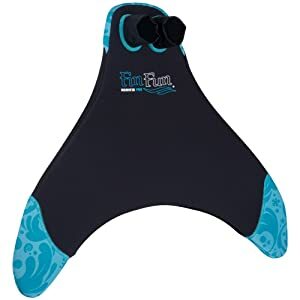 A floatable rubber full foot pocket fin which is perfect for snorkelling and body surfing. 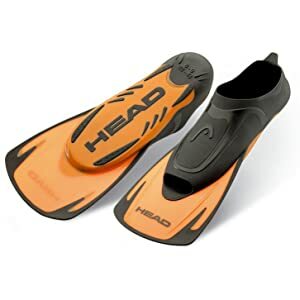 Head energy swim fins are specifically designed to reinforce a powerful kick and enhance thrust. It is an ideal advanced training fin, which comes with a self- adjusting foot pockets that promotes both comfort and flexibility. 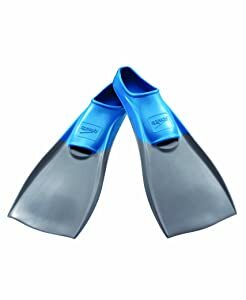 A full foot pocket fin with a long sole plate that helps swimmers maintain a proper position. This product is specially designed for comfort and durability, while allowing its wearer to experience a new level of fun. These are training tools which can help swimmers in developing a stronger, faster, flutter kicks and provides additional fit and comfort. Fin Fun Mermaid Tails with monofin are designed combine fun with learning the proper techniques for swimming. It makes use of a high quality material and can fit children, as well as adults alike. A mermaid tail fin costume that is perfect for swimming, though it doesn’t come with the same monofin as other varieties. The tail is made from high quality polyamide fabric. Package include: One Mermaid Tail fabric, fins not included. Sun tail mermaid tails, are made out of sparkling swim suit fabric, combined with engineered monofins which provide better motion control. There are plenty of reasons why swimmers use swimming fins. First, it is a useful training tool for both advanced swimmers and beginners. It also enables a swimmer to move faster through the water and gain muscle flexibility. It keeps their legs up while learning the front crawl or backstroke. Second, it is great for enhancing the heart and circulatory function of the human body. This is beneficial for the overall wellness of the swimmer since it aids in the burning of fats. This is the result of having to exert more effort during movement when using swimming fins due to its resistance in water. Aside from speed, muscle strength, cardiovascular benefit and endurance, safety is also one of the most important reasons for using swim fins. It protects the feet from any injuries due to sharp corals underneath water. Most importantly, there is a greater chance to escape a strong tide if in case a diver experiences this situation under water and their fins will provide them ability to swim fast. There are few things to remember when it comes to properly using this swimming accessory. Fins have various sizes, and it should fit the swimmers feet correctly. It should match the actual size of the foot because it could affect their kick speed. In addition, it should also only be worn in the water since these have no grip, making it hard to walk on land and can result in damage to the fins. Furthermore, it is necessary to wear fin socks before wearing those rubber fins to prevent blisters caused by rubber – skin contact. Likewise, adjusting the heel is required for full foot fins to prevent the fins from sliding while swimming. On the other hand, holding the heel strap and sliding the feet and toes first are for open heel fin. Training with fins is one way to make a better swimmer. However, there are certain arguments that reveal its drawbacks. First is when a swimmer becomes too dependent on the tool and he or she wouldn’t be able to swim efficiently without using the tool. Second, it can’t be used during meet warm-ups. Third, it may cause blisters and bruised heels on the feet which could be painful for the swimmer. Furthermore, flippers could stress out sensitive joints, the knees and ankles. Swimming is a fun activity for a lot of people, whether they do it for recreation or as a professional sport. Like any physical activity, however, some measure of safety precautions must be practiced. For example, swimmers would certainly benefit from the use of earplugs, as well as specialty swim suits—especially if they intend to explore the waters deeper. The eyes are another important consideration, too. Basic swimming goggles can do a lot when it comes to protecting it, whether it be from the saltiness of the water or simply helping the swimmers see better underwater. These days, with the help of advanced technology mp3 player for swimming, is yet another accessory that can make this activity even more fun. Though often used by synchronized swimmers to help them perfect their performances, it can also be used to help train beginners through the use of audio tutorials. Of course, one could simply put on their favourite song and do their laps whilst listening to it—exercise and music get along quite well, don’t they? Pool float and pool toys can also be used to help encourage children to learn how to swim. There are various designs, shapes, and sizes to choose from. These can also be used by both kid and adults alike. It is inflatable, soft, comfortable and easy to use. For example, the inflatable shark swim fin it is just like wearing a back pack with adjustable straps. These accessories are all designed for fun and playing as well as a life saver which even smallest children can enjoy the pool. In addition, pool slides can be a great attraction too. The main purpose of swimming fins is to aid the swimmer or diver to be able to swim more efficiently when in the water. At the same time, it can also help their bodies to become fitter and stronger, as the fins provide them with a challenging exercise. It is especially useful for athletes who want to further develop their cardiovascular function as well as their arm, and leg muscles. Of course, in order to benefit from the use of these fins, it is important to find the right one for yourself. Wrong sizing can lead, not only to discomfort but to potential injuries as well. Pay attention to the details, including size, model, and durability. Look into the features of the fins as well, these need to match your needs. 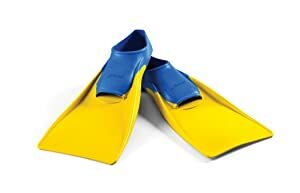 Lastly, keep in mind that these swimming fins are merely tools to help boost your own abilities. It would be best to not rely on them so much—this is the trouble that many experts say often arise when using the fins. We hope this article and review was able to help you better understand the benefits of swim fins. Use it as a guide to find the best one for your needs.